PACIFIC OCEAN (NNS) - The USS George Washington (CVN 73) Aviation Fuels Division, with help from Puget Sound Naval Shipyard workers, accomplished an unprecedented undertaking at sea by moving a massive fuel purifier seven decks below, March 29. The 4,000-pound jet propellant five (JP-5) fuel purifier being moved is responsible for separating the useable, raw fuel from water and sediment. JP-5 is repeatedly refined via the purifier to remove contaminants that have accumulated while the fuel sits in storage containers for later use. The JP-5 fuel is important to the functionality of an aircraft carrier. The fuel is used to perform a variety of functions including controlling the ship's balance; fueling the fighter jets on the flight deck and the tractors that stage them; and, running the ship's emergency diesel engines and auxiliary generators. "We [replaced] this critical piece of equipment while at sea because we did not have an opportunity to do it in port," said Aviation Boatswain's Mate (Fuel) 1st Class (AW/SW) Nelson Lubin, leading petty officer of George Washington Air Department's V4 division. "Under normal conditions, the unit would be replaced by qualified shipyard workers while the ship is in port. A large hole in the ship is generally cut to facilitate the installation of the unit, so us getting it done at sea, on our own, is an incredible feat." 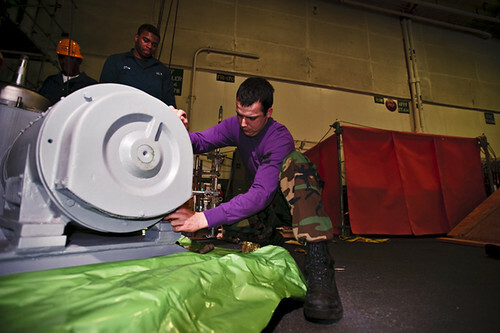 George Washington recently deployed from Commander, Fleet Activities Yokosuka due to complex nature of the natural disaster that struck Japan on March 11. The ship's repair status of "under maintenance" to "fit for sea" occurred in just five days. This resulted in the postponement of several open projects and installations until Washington was fconsidered to be safe and sea-worthy. "I continue to be amazed each and every day we are at sea by what our Sailors and these civilian craftsmen are accomplishing," said George Washington Commanding Officer Capt. David A. Lausman. "They are working around the clock, putting their heart and soul into their work, and I couldn't be prouder to call them shipmates." The team of Sailors and their shipyard counterparts successfully relocated the now-disassembled fuel purifying unit — similar in size to a Volkswagen Beetle — from the ship's open hangar bay, down seven decks to a pump room via a ladderwell in less than eight hours time. "I'm really proud of what our team did today. It might be the first time something like this has ever been attempted — at least for us it is," said ABF3 Richard Bell, from Syracuse, N.Y.
"I really have to hand it to the civilian riggers. Without their help we would not have been able to accomplish this," said Bell. George Washington is the Navy's only permanently forward-deployed aircraft carrier, ensuring security and stability across the western Pacific Ocean.